"Working for Native Peoples at the Nexus of the Americas"
The Fundación Darién is a private, non-profit, non-partisan Panamanian organization established to develop and support programs of interest to indigenous people. The foundation, established and administered by Native Americans, has a regional focus on the Darién area of eastern Panama and the Pacific western lowlands of Colombia. 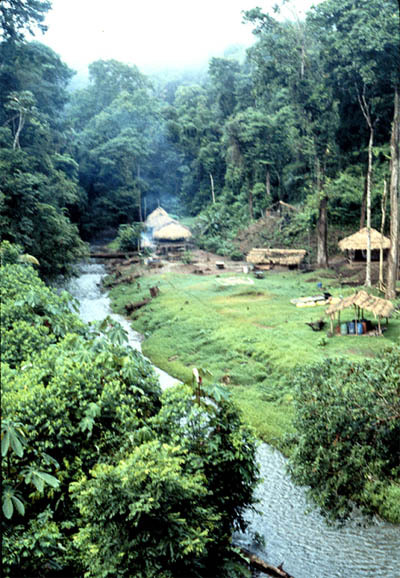 The Darién is the least developed area of Panama and a region of large tracts of lowland, tropical rain forest. 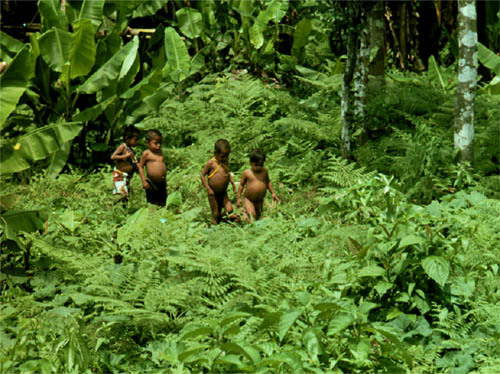 Portions of this forest are protected within the Darién Biosphere Reserve and the Emberá-Wounan Comarca, an indigenous reserve. This rain forest, a resource of paramount importance to the resident Native Americans, is quickly disappearing both within and outside of the protected areas. 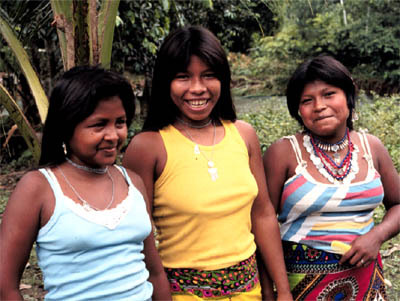 The Darién region is populated by several indigenous groups, the Emberá, Wounan and Kuna, who rely extensively on the continued existence of this threatened resource. These groups practice a traditional life-style of subsistence horticulture augmented by fishing, hunting and gathering from the old-growth forest. The Emberá-Wounan Comarca government, created in response to the national government's pressures within the last 20 years, has had difficulties in responding to the many social, political and economic problems faced by Native Americans in the region. The Fundación Darién seeks to cooperate with the regional indigenous government in tackling the multitude of problems that adversely affect independent auto-determination. The foundation sees the continued destruction of the rain forest and disenfranchisment of Native Americans from their traditional lands as a principal threat. The foundation is by nature conservationist oriented and finds a natural ally with conservation organizations. Yet the foundation sees wise economic development as the key solution to self-determination. We therefore seek solutions and support programs that wisely balance these two apparently contradictory concepts. Our traditions as Native Americans reach back in an unbroken lineage to pre-history. Our traditions incorporate complex systems of ecological and social knowledge that are highly adaptive in our environment. We celebrate the values of our ancestors and seek ways to ensure the continued relevance of traditional rituals and beliefs in solving contemporary problems. Non-Native Americans often misunderstand the value of our traditional heritage. We seek to interpret and incorporate our traditions in the activities of the foundation. The foundation, incorporated in 1991, is seeking experienced agencies who can help support our programs and help us realize our goals. We are open to suggestions and can submit specific proposals in any of the focal areas listed above. Our membership is long on enthusiasm, motivation and human resources, but short on economic resources necessary to support our goals. This project, the translation of traditional narratives and myths from taped Emberá recordings into Emberá, Spanish and English texts is near completion. An indigenous artist is creating detailed pen and ink drawings that illustrate the stories. This collection of hundreds of pages of texts, apart from its anthropological value, will serve as one of the very few documents written in Emberá and translated into European languages. We hope its publication will serve as a catalyst for bilingual education and foster a respect for traditional knowledge. Two founding members of the foundation, Rogelio Cansarí and Daniel Casteñada, have successfully completed a contract with INRENARE, the Panamanian government agency responsible for managing natural resources. They undertook six months of socio-cultural investigations within three regions of the Darién. Their study focused on land-use, demographics and natural resource management. The foundation supported their work. The Fundación Darién has lobbied with AID of the US government to create an educational assistance program for Emberá-Wounan students. AID favorably considered the proposal an invested thousand dollars of educational aid. As traditional cultures, the Emberá-Wounan lack the professional skills necessary to deal effectively with modern problems; education and a development of a wide diversity of professional and technical skills is the first step in creating effective solutions. The ethnobotanical project has as its goal an encyclopedia of economic and medicinal plants used by Native Americans in the Darién. Much ethnobotanical work has focused on the plant identification and isolation of active principles from medicinal plants. We focus on the native collection, preparation and cultural significance of the many species used by indigenous herbal specialists. We have prepared a computerized database and coding system to maintain information about medicinal and economic plants and have over 600 species in the system. We have done some field work but much remains to be done before we have complete ethnobotanical descriptions.